"It's easy to see ourselves as trapped when we listen to fear instead of to inspiration. "Chatty Clients" are one of five especially challenging client types. Sometimes "Chatty Clients" are happy and just love to connect with anyone they meet, home stagers included. Others are chronically depressed and desperate for someone to talk to and help fill the day. 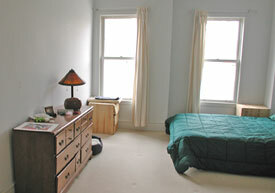 Enter the home stager -- a captive audience! I did a coaching call with one of my graduates last week and her client actually greeted her with a full course meal and plastic containers of left overs to take home after the staging consultation. Chatty Clients can put you out of business or they can be a real revenue boost depending on whether you have set the right pricing strategy. In course 2 of the Staging Diva Training Program, The Business of Home Staging: What you need to start and how to grow, you'll learn how you can make m0ney with Chatty clients with the right pricing strategy. You can read my series of articles on the different client types starting here. Be sure to add your comments to the 5 part series especially with client example from your own staging business. 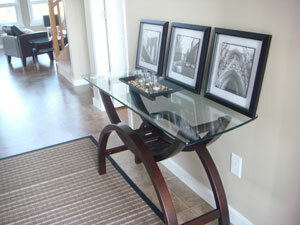 Home staging is a great business for anyone with a talent for decorating and an interest in real estate. These are the common denominators among my students; men and women who range in age from 24 to 76 and come from all over the globe. I decided to celebrate a few of the men who completed the Staging Diva Home Staging Training Program in a recent article and blog post. They have had outstanding results in their respective businesses in Tasmania, Southern California and Nashville. Do You Want Publicity Too? If you've ever wondered why certain students are featured in my articles, blog posts and newsletters, it's because they are the ones who keep in touch and send me news! I'm the friendliest editor you'll ever meet because I really want to promote Staging Diva Graduates. Send me your stories so I can give you some f/ree publicity! Consider it practice for when you go after those major newspapers, magazines, TV and radio! If you've spent much time looking at paint company displays or if you have your own Designer's Kit of samples, you know there are literally hundreds of whites to choose from. Some are more pink, yellow, blue or green but they're all "white"! Choose your wall colors first so your whites will work with all of them. To unify the space and cut cost: Keep all trim and interior doors the same. Keep all ceilings the same (though not the same as your trim color). Consider the price of gas and the v@lue of your time whenever you feel tempted to visit a potential client for f/ree. F/ree home staging estimates invariably end up being f/ree consultations because once you're in a client's house they'll ask your opinion on everything from how to furnish the living room to what color to paint the master bed room. If you spend hours visiting prospective home staging clients for f/ree, I'm afraid you're on a a fast road to burnout and bankruptcy. I don't want you to go down that road which is why I decided to share the script I use to book my own home staging clients. You can copy me word for word in your own conversations and stop running around doing f/ree estimates and start earning what you're worth. 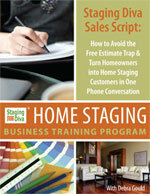 Learn more about Staging Diva Sales Script: How to avoid the f/ree estimate trap & turn homeowners into home staging customers in one phone conversation. Now that home staging has become such a growth business, all kinds of people (and some well-financed companies) are coming out of the woodwork making claims. It's very confusing to anyone thinking of entering this unregulated field. It's pretty hard not to feel like "Chicken Little" after a few hours in front of CNN these days. I try to filter out some of that negative news coverage. It's not motivating and half the battle in running your own business is keeping up your momentum. This is hard to do if you're running around like Chicken Little worrying the sky is falling. I'm certainly not saying that we should put on rose colored glasses and ignore reality but it's also important to remember that in the news business, the worse they can make everything sound, the more you'll be glued to your television. I know the current economic news is scary, but keep in mind that there is actually more security in working for yourself than in trusting your destiny to a company whose first concern is not your well being. You might have a j0b today, but will you have one tomorrow? At least when you are your own b0ss, especially if you're in a business like home staging with little to no overhead (you don't need inventory, office space, or a store front), you are the one charting your course, not living in fear waiting for the other shoe to drop. I say this as someone who has been an entrepreneur supporting myself since 1989. There have certainly been times when I had to cut back on the non-essentials like take out meals, social events, babysitters, trips, wine, movies, etc., (heck I drove the same car for 18 years) but I always continued to invest in my business because that's what would make me a f.i.n.a.n.c.i.a.l return. Many of my students start their staging businesses part-time while they keep their other j0bs, and others leave them or turn to staging when they are faced with a sudden j0b loss or divorce. I had the craziest staging request last month during the Toronto International Film Festival. The city was filled with stars for the week attending their various premieres. My business phone rang at 6:45 AM on a Sunday and I only answered it because I was so annoyed. "Hello, this is the Four Seasons calling to see if you'd be able to style a room for one of our guests for a TV interview they're doing tomorrow. The catch is you'd have to do the work between 3am and 6am starting tonight." My answer was a definite no, but only after I hung up did I realize I should have milked the caller for more details before turning it down! Who knows, my clients might have been Brad and Angelina! Not that I'd have got to meet them in the middle of the night! 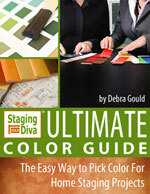 I hope you find the content of this issue of Staging Diva Dispatch helpful. I welcome your opinions, success stories and/or new story ideas; it's a challenge deciding what to write about month after month! P.S. If you miss the live event I'm holding October 1, don't worry you can download a past edition of Ask Staging Diva Live here. 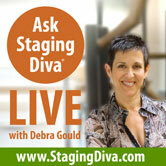 What's New at Staging Diva? It has been really busy at Staging Diva headquarters. Several new products that have been under wraps are finally ready to go. I'm especially proud of the new Home Study Kit which will have special appeal to anyone with a slow internet connection or computer challenges. If you've been reluctant to order the Staging Diva Home Staging Training Program because you wanted a physical product that you could hold in your hands rather than downloading, your wait is over. You'll read more about this below. My two Ultimate Guides have a whole new look in preparation for my third book in the series, to be released in the months ahead. Let's see we've got the Ultimate Portfolio Guide, the Ultimate Color Guide, what could be next? As a Staging Diva Dispatch subscriber, you're the first to hear that the Ultimate Design Guide will be published on time for Christmas. This will be a great gift idea for the people in your life wondering how to support your success as a home stager! 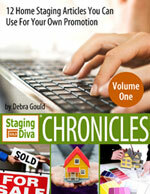 In the next week I'll also be releasing the first volume of Staging Diva Chronicles: 12 Home Staging Articles You Can Use For Your Own Promotion. Lots of you have been wondering how to generate content for your own newsletters and Staging Diva Chronicles will help you do just. Keep an eye on the Staging Diva Shop for all the latest products and services. I'm really excited about starting the month of October off with a F/REE live event to give aspiring home stagers a chance to ask me their questions. If you became a Staging Diva Dispatch subscriber within the past three months, watch your inbox for your invitation to join me in this special event. If you want to build your home staging business it's worth investing in a decent digital camera, but an absolute must in my opinion is a wide-angle lens. It allows you to capture SO MUCH MORE of a room. The difference is astounding. Without my wide-angle lens there is no way I could have shown both sides of this room to be able to accurately portray the transformation I achieved by changing the position of the bed and staging with rental furniture and accessories. The wide-angle lens gives perspective to my before and after portfolio shots. I replaced the curtains with pre-made drapery panels and used the $1.49 tie-back technique I describe in course 3, Taking the Mystery Out of Home Staging Consultations. 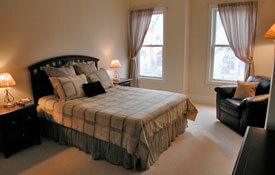 I also brought in new bedding, accent pillows, lamps and furniture to create this master bedroom. I bought my first digital camera 8 years ago, it was a Nikon Coolpix 990 with a separate wide-angle lens. I built my entire business from the portfolio shots I took with that camera. While it cost me plenty at the time, I never regretted it because it served me well and brought me hundreds of clients. I would still be using it, were it not for the battery compartment catch that finally gave out and was almost as expensive to fix as getting something new. Prices of digital cameras have come down considerbly in the years since my first, and the capabilities of the cameras have increased. So you get way more features and better pictures, for less m0ney today. This year I got a Nikon Coolpix P5100 with an adapter so I could still use my same 8 year old wide-angle lens. My new camera sat in the case for over a week until I had to take it out to a client and was forced to see how it worked. While it does have lots of options, I just turn it to "automatic," attach my lens, turn the flash off (because it doesn't work with the lens attachment) and shoot. No big deal! What was I so afraid of? Before you buy anything, go out to a proper camera store so you can get the right advice on cameras. If you're in some big box store talking to someone who also sells microwave ovens and big screen TVs, do you really think you'll get proper camera advice? What I use may or my not be right for you. I just wanted to be specific since so many people ask me what camera I use to shoot my portfolio images. Before a very dark shot of the dining room. After a close up "vignette" created from the larger shot, by cropping and fixing the lighting. Another secret weapon in my arsenal for getting great portfolio shots is learning how to use digital image editing software. 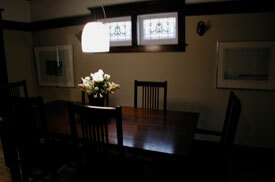 With a very dark dining room as shown above, I created the vignette you see above at right by cropping in on the flowers and deleting everything else. You'll get lots of tips like these in the, Staging Diva® Ultimate Portfolio Guide: Winning Clients With The Perfect Home Staging Portfolio. If you're getting calls and no clients, or lots of visitors to your website and no calls, I highly recommend you invest in this ebook to find out where you're losing business. If you get one more hour of work out of what you learn in this Guide it will more than pay for itself. I'm really excited about a radio interview I'm doing this week for Live 88.5 Start Up (Ottawa). This is my fifth radio show and I love answering questions on air. I've been featured on the radio in Ontario (CBC Radio One), Los Angeles (CBS Radio), Denver (Radio Colorado Network) and Lincoln NE (KFOR 1240). The best part is, every one of these shows invited me on because they found me from my website. Graduates who participate in the Staging Diva Directory of Home Stagers get media attention too! 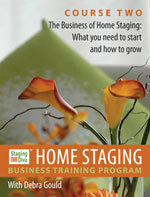 Learn how to join the Staging Diva Directory of Home Stagers so you can get media exposure too. 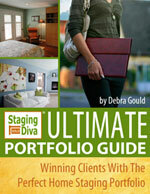 Would you like the complete Staging Diva Training Program Delivered Right To Your Door? I taught my first group of students how to start and grow their own home staging business back in January of 2005. Today there are over 900 Graduates and many more doing individual courses, all over the United States, Canada, Europe, Australia, New Zealand, South Africa, Brazil and Barbados. Up until now the only way you could order the Staging Diva Training Home Staging Training Program was by ordering the downloadable course notes and course recordings. This is still an excellent option because you get everything sent to you by email as soon as you order the program and it keeps the c0st down to only $995 (an amount you'll likely make back with your first client!). By the way, you can also order downloadable courses one at a time for $249. For those students who don't mind waiting for their materials to be packaged up and mailed to them, you can now order the Home Study Kit. The Home Study Kit is available now for $1295 or you can go with 3 easy payments of $495 spread over three months. No matter whether you order the Home Study Kit or the downloadable Staging Diva Program, you get the the same professionally edited course recordings and your Graduate Certificate is sent to you in the mail along with a sales sheet you can use for your own marketing efforts. Congratulations to Staging Diva Graduate Lisa Kleino of Perfect Fit Home Staging (MI) who joined the Staging Diva Directory of Home Stagers at the start of the summer and has already got two projects from it. I also want to congratulate her on making such great use of her coaching time with me in September. We spoke weekly and Lisa said, "you always re-motivate me with lots of new ideas to build my business. You are a great support system." Did you know that when you order the Staging Diva Home Staging Business Training Program, you'll be invited to sign up for one hour of coaching time with me at half the normal rate? You have a full 6 months to use your time and you can split it into up to 4 shorter sessions by phone as Lisa did. I call you so there's no long distance fees. Congratulations to Staging Diva Graduate Fabia MacNair of Styling Spaces (ON) who, in addition to staging more than one house a month since starting her business, has already done presentations to a number of real estate offices, participated in a house tour for charity (a great way to get media exposure while supporting a good cause) and is about to speak at the Home Buyers and Sellers Expo. Congratulations to Staging Diva Graduate Chris Lodge of House Dressing (BC) who staged her first house after completing the program last month. It was in a Prince George subdivision and sold within a weekend despite there being 6 others for sale in the area and despite the fact that the property she staged was the most expensive at $379,000 compared to a low of $305,000! This is one of Chris Lodge's portfolio shots from transforming a vacant home in a new subdivision. Pretty awesome for a first project! Chris will be using this in her Staging Diva Directory Portfolio listing currently in development. Serving State of South Carolina: Mount Pleasant, Charleston, Sullivans Island, Isle Of Palms, Folley Beach, James Island, Daniel Island, Summerville, Wadmalaw Island and Johns Island. Congratulations on getting your portfolio together and putting yourself out there for homeowners, agents and the media to find. With the fall real estate season underway, now is the time to promote your home staging business. It's a tough market and home stagers offer a beacon of hope to home sellers.